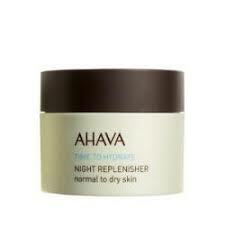 What Is Ahava Night Replenisher? AHAVA Time to Hydrate Night Replenisher — Normal to Dry Skin, US $51 for a 1.7 fl. oz. jar, is an overnight treatment solution that helps replenish your skin’s lost moisture and nutrients to reinvigorate your skin and relieve it from tired look. However there are many other well known brands in the market with similar effects and ingredients and they come in a affordable range. This product is brought to you by AHAVA Dead Sea Laboratories, the skin care brand that boasts of the skin rejuvenating properties of marine ingredients found in the Dead Sea. All AHAVA products use marine components as the key ingredients to its skin care formulations. Ahava Night Replenisher — Does It Really Work? Improve your skin’s youthful firmness and elasticity. Restore optimal moisture and nutrient levels to revive your skin’s ideal health and appearance. Enhance the radiance of your complexion while also rendering lightening effects on hyper pigmentation. Facilitate faster skin healing, rejuvenation and renewal to reveal brighter, unblemished skin. What Are The Ingredients In Ahava Night Replenisher? Glycoproteins: Improves your skin’s natural hydration mechanisms and helps restore your skin’s natural capability to capture moisture and keep it in. Jojoba Seed Oil: This ingredient acts as an anti-inflammatory agent, soothing the irritated skin.It can cause some side effects such as rash and allergic reactions. Sweet Almond Oil: Loaded with rich amounts of fatty acids, it leaves your skin with a soft, well-conditioned feeling and appearance, and aids in calming and rejuvenating your skin. Retinyl Palmitate: A Vitamin A Derivative that encourages faster skin cell regeneration as well as more frequent renewal and turnovers. Sea Salt and Dead Sea Water: Provide added nourishment to help revive your tired skin as well as provide a light exfoliation to encourage renewal. Vitamin E: It works to block free radicals from the body, which play a large part in the aging process. If we can fight off free radicals, then we can reduce wrinkles and keep the skin youthful-looking. Although it may lead to skin rash. Ahava Night Replenisher must be applied generously only on freshly and thoroughly cleansed face. Ahava Night Replenisher has bee specifically prepared and formulated to suit people with normal to dry skin types. This product has a relatively lightweight consistency that easily penetrates your skin. This product strengthens and protects the skin. Although many user reviews say it isn’t very effective. This product is not suitable for use on all types of skin, and therefore requires you to know your skin type as this product is recommended only for normal to dry skin. Ahava Night Replenisher reviews indicate that many users disliked this product’s overpowering fragrance which could also cause skin irritations. There’s a higher preservatives concentration in this product compared to its beneficial ingredients. Does Ahava Night Replenisher Have Any Side Effects? Skin irritation and allergic reactions due to several ingredients, including fragrances. Increased risk for nerve damage and brain-related dysfunctions due to phenoxyethanol. Increased risk for permanent skin damage with repeated contact with chlorphenesin.